The contact view displays all existing address books and their contacts. It also provides with different features to comfortably manage contacts and address books. On the InLoox PM Ribbon, in the Views group, click Contacts. Create a new contact In the New group, click New Contact. Edit a contact Choose a contact from the list and click Edit in the Actions group. 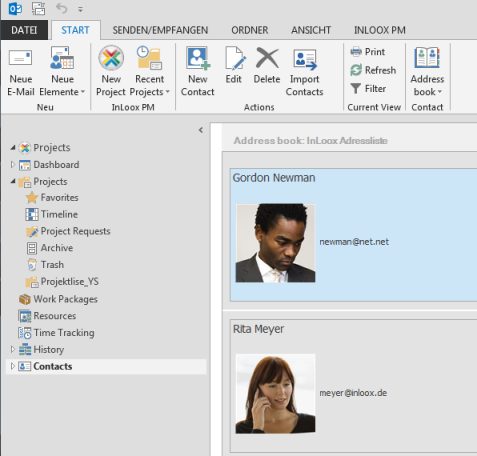 Delete a contact Remove one contact by clicking Delete in the Delete group. Filter the contact information Click Filter in the Current View group. To learn how to work with the filter, see Search and find projects, the Use filters section. Print the contact list In the Current View group, click Print to start the quick print feature of the contact list. Refresh By clicking the Refresh button in the Current View group, all changes are updated and the view is reloaded. Create a new address book and manage it In the Contact group, click Address book and choose from the drop-down list Manage Address Book. For more information, see Add, manage and delete an address book. Search the contacts The search bar permits to find quickly any contact. For more information about this feature see Search and find projects. 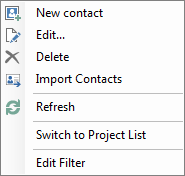 The context menu provides you with almost all basic features that can also be found on the InLoox PM Ribbon, such as New contact, Edit..., Delete and Refresh. It also provides features such as Switch to Project List and Show Filter. Right-click in the list to open the context menu. For more information about the filter feature, see Search and find projects. F2 Refresh the project list. How to edit the InLoox PM 8 contacts view • Copyright 1999-2019 © InLoox GmbH. Tous droits réservés.